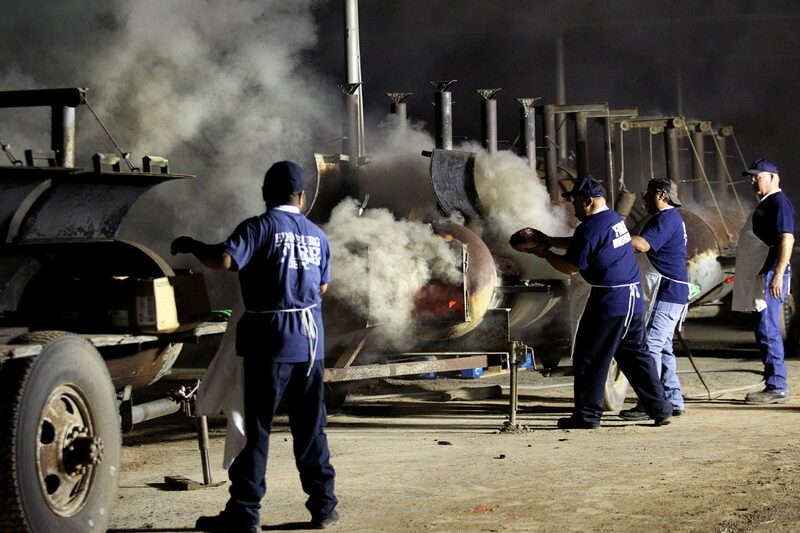 Edinburg firefighters placed 5,000 pounds of top sirloin on nine smoking pits Saturday evening and cooked for eight hours at the service center. The firefighters also cooked 5,000 baked potatoes for the 69th annual Barbecue at Edinburg Firefighters Central Station on Saturday in Edinburg. EDINBURG — As the rain began to subside Saturday evening, and while other Rio Grande Valley residents were celebrating Mexican Independence Day or watching boxing, dozens of Edinburg Fire Department employees spent the entire night cooking 5,000 pounds of sirloin and 5,000 potatoes. For 69 years the Edinburg Fire Department has been supporting its volunteer firemen through a barbecue fundraiser. Over the years, it’s only gotten bigger. Rolland Pursley, deputy fire chief, started as a volunteer fireman in 1975. In 2006, he became one of the first on-staff firemen in Edinburg. This is his 43rd barbecue, so at this point, he knows the process like the back of his hand. Starting at 8 p.m. cooking committee members begin to unwrap the packages of meat from a pickup truck. They do this and watch the meat until 5 a.m. when the potato committee arrives and cooks the 5,000 potatoes. At 11 a.m., the slicing committee begins slicing the meat and preparing the plates. It’s a system that hasn’t let them down for all 69 years of the event. Though it used to be a completely volunteer fire department, now they have 49 paid staff and 60 volunteers. All are present somehow during the preparation process. Once the sun rose and the plates were put together, customers immediately began coming. The department usually raises about $25,000 during the fundraiser, Snider said. The next morning, many of the same workers preparing the plates were seen delivering them to the line of vehicles ready to pick up at the Edinburg Central Fire Station. “It’s really good,” yelled one person inside his vehicle, with a piece of sirloin dangling from his mouth.